Background: Phycocyanin (PC) is a major light harvesting pigment of cyanobacteria. It has gained importance in many biotechnological applications in food sciences, therapy, cosmetics and pharmacological processes thanks to its blue color and to its properties. Arthrospira platensis, also called blue algae, and commonly known as spirulina, is very interesting for its high content of PC. The commercial production of spirulina has long been implemented in ponds, but photobioreactors and other innovating culture techniques tend to develop. Methods: A number of extracting methods have been studied to isolate this blue pigment from spirulina. Phycocyanin extraction is carried out from wet or dry biomass. To increase the extraction yield, intensification techniques may be used as pretreatment or simultaneously with the extraction. Results: This review, based on literature framework, describes how PC is produced, extracted and analyzed. It particularly highlights the different techniques of phycocyanin extraction from Arthrospira plantensis. 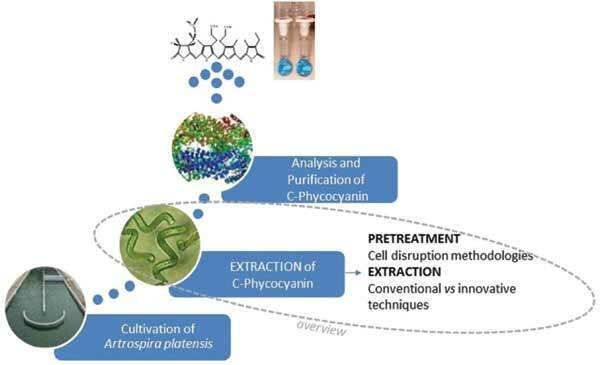 Numerous physical, mechanical, chemical and biological methods of cell disruption have been studied on spirulina to facilitate the extraction of PC. Analysis and Purification of PC have been also broached. Conclusion: Arthrospira platensis can be easily produced thanks to shallow ponds or other innovative techniques like photobioreactors. It contains an important quantity of PC which is a pigment protein with many biological properties. Phycocyanin can be extracted from spirulina thanks to different techniques such as maceration, or it can be extracted by intensification methods like Ultrasound. Green Extraction Team, UMR 408, Université d’Avignon et des Pays de Vaucluse, Avignon, France 2Algae Natural Food, Riquewihr, France.